Lighting-Gallery-net - good ol' mercury vapor/Champion 400w Mercury Vapor lamp quite a rare find!!! Champion 400w Mercury Vapor lamp quite a rare find!!! 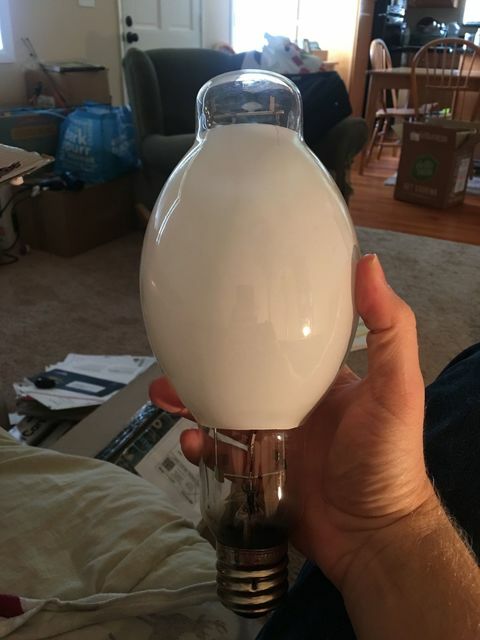 The time has come, I finally got a Champion mercury lamp! Sylvania made but still awesome. It's old enough that it has the pre /RS frame, commonly found in Sylvania Banner lamps. Looks NOS. I bet it'll have the beautiful limey green color typical of early /Ws! Nice lamp! eBay I'm assuming? Yes, as part of a large lot of bulbs. The rest are 300w and 500w incandescents, Ken-Rad and Champion. 50 LPW? I thought mercs were 23 LPW or something like that. Nah I believe you're thinking of Halogen man..
20,000/400 equals 50 lumens per watt. @xelaverse is that a /C? You said "warm white". Well, I dreamed of having a Champion merc lamp, and Dave gets one--JEALOUS!!!! but I have a 1962 Hammond C-3 organ with what will soon be a Leslie 122 2 speed converted by me from a 22-R single speed rotary tremolo speaker unit, with a twin 6550 beam power tubes in push-pull (rare 500 dollar each black solid plate (no holes like later ones) Tung-sol 6550 beam power tubes) amplifier that will shake the walls to dust if you crank the master volume and floor the expression pedal on the organ! Jon Lord of Deep Purple had the exact same rig as mine! Or shall I say I have the same C-3 as HIS? SO--yeah I still want a Champion merc lamps and an ITT, too bad they were made by Sylvania though, would have been nice if they were made by the brands stamped on them. Sylvania made merc lamps for everybody it seems LOL! Hey Dave, did you ever seen the Champion Cyan Coated Night Light that I have in my collection? Do you plan to do anything with it? Or are you going to display or store it? Just another addition to my vast historic HID collection, preserving 20th century lighting for future generations to see.